Life Alert News: Hair Raising Health Facts. The teenage girl runs through the dark, foreboding woods. Blood is splattered all over her, as well as fear. 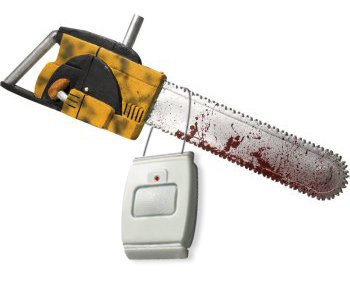 A loud and deadly chainsaw is heard – coming closer. The girl runs faster trying to get away from the sinister metal teeth that will chew her up and spit her out in pieces of ripped skin and shredded muscle. She spots a house not too far away. Safety! She is relieved and runs to it. She bangs on the door - no answer. Instead, the door slowly creaks open as if whoever inside was expecting her. She calls out a timid, “Hello”, and is greeted back by silence. The girl quietly walks through the house. The old floor boards moan as if every step she takes splits their fragile skeleton wood. She comes to a closed door that she knows she must go through to find help. She slowly opens it to blackness and places her foot forward when suddenly something lurches at her. She screams and jumps back as a cat lunges towards her. It leaps to the floor, hisses, and appears to be just as scared of her as she is of it. The teen laughs and tries to coax the cat to come over to her, but the feline keeps hissing. “Come on, it’s ok,” the girl says reaching to comfort the scrawny ball of fur but the animal continues to hiss. The girl then sees the cat isn’t hissing at her, but at something over the girl’s shoulder. Suddenly, a chainsaw is heard right behind her. Imagine going to your doctor for stress and anxiety but instead of getting medications, he prescribes for you to binge watch scary movies. You may be thinking your doctor is an incarnation of Dr. Jeckyll and Mr. Hyde, as you wonder what kind of diagnosis requires fear to be the cure. Perhaps your doctor is well informed that body fluids flow more easily when the heart is palpating swiftly like when a person is frightened, thus more free flowing fluids can reduce stress. “Fear makes your brain flood with healthy chemical substances that excite your mood and release feelings of euphoria…” claims Dr. Margee Kerr. The fluid that floods your brain includes endorphins and dopamine, natural chemical compounds that makes a person calm and content, while easing anxiety and stress. But how can a person be calm and content when they are being scared? That depends on the type of fear, the situation, and the environment. When watching scary movies, generally a person is in the safe compounds of their home or out with friends. Temporary anxiety may occur when engulfed in a scene involving an innocent teenager running for her life from a chainsaw wielding psychopath, but the brain is aware that the environment is safe, thus eliminating one’s natural Fight or Flight reaction. In other words, the excitement is real but threat is not. Moreover, when you’re spooked, your body also produces a chemical called oxytocin. This hormone helps people bond with one another. So when sharing a frightening experience with someone, it can actually draw the two of you closer together and solidify a relationship. And as we all know, bonding with loved ones can reduce stress and anxiety. Just as important, fear can help determine if a person’s nervous system is functioning, says Dr. Peter Yellowless. “You tend to sweat more, your breathing rate increases, you look red, you may have tingling in your arms, legs and cheeks, and more blood goes to your muscles.” Having the body physically react to something scary on a screen can determine the state and health of a person’s nervous system, minus the jumpy nerves when a chainsaw comes on screen. Grant it, there are all kinds of fears, such as the fear of public speaking or parachuting out of an airplane for the first time. These exhilarating fears release dopamine which can change brain chemistry. Once the scary experience is over, a person may feel better and – perhaps – even more confident. However, situations may arise in life that can be just as scary as running from a chainsaw. Some of these life threatening events, such as a fall, can occur in the safety of your own home when you least expect it. Like a cat jumping out of nowhere, a fall can come out of nowhere too. Even taking a shower can turn into a scene from psycho if you fall and can’t get up. A person’s home sweet home can turn into a house of horrors for the elderly and people with health issues if no one gets them help right away. That’s where Life Alert comes to the rescue. One press of the lightweight emergency button will summon help faster than adding up the body count in a slasher movie. Life Alert Personal Protection system includes a patented 2-way communication monitor and a waterproof, medical alert HELP button that can be worn on the wrist or as a pendant. But if you are an active person who may prefer walking in the woods…alone…at night…then Life Alert also offers Protection-on-the-Go with Life Alert’s Mobile HELP phone. When in trouble, simply press the help button and our dispatch center will get you help fast, 24/7. Coverage is nationwide and you can even be located by GPS, where available. Life Alert offers such a variety of cutting edge protection packages that will suit everyone’s needs so living in the comfort of your home won’t be like spending the night in Amityville. So get those happy chemical compounds, endorphins and dopamine, streaming again by having Life Alert and leave the scary heart pounding scenarios to a gutsy teenager against a chainsaw. “Boo! It’s good for you.” Keady, Cameron. Weblog post. TIME For Kids. 31 Oct, 2014. “Halloween treat: Getting scared can be good for your health.” McManis, Sam. Weblog post. Health & Fitness.